Tom and Cheryl were lost. They had been driving and driving but were nowhere closer to reaching home than when they had started. They, however, were blissfully ignorant of this fact and were quite content to just keep going, arguing occasionally about the direction, but both certain that they'd get there eventually. Tom was a very reliable and capable man and, being confident in his own abilities, was sure that by picking the path that seemed right to him at the time that he'd find the way. Cheryl had a ton of maps that she had collected from all over the world and she constantly studied them and attempted to apply them to whatever landmarks she saw around her in order to help direct them. Whether or not these maps actually applied to where she really was never seemed to occur to her. One map, after all, is just as valid as any other. There were two reasons that they weren't very concerned about being lost: One was that they didn't really understand that they were lost in the first place (Cheryl's maps occasionally kind of fit where they were) and the other was that they didn't think it mattered anyway because the trip itself was pretty fun. They had a really nice car and there were lot's of distractions along the way. There were fun places to play and do whatever they wanted. There were great restaurants, good places to gamble, and lots of other things to keep them amused and distracted. Life, they thought, is all about the journey after all. You'd better have fun on the journey because you may never arrive at your destination anyway. One day, as Cheryl was busily trying to make sense of another one of her maps that had no relation to where they actually were, Tom saw another one of those roadsigns that warned that the path ahead held danger and that the road home was off the freeway and was down one of those tiny off-ramps onto a narrow and rocky little road. He was really sick of these signs and wished someone would just take them down. They had tried following one of these signs before and it only led them away from all of the things that they needed like air conditioned hotels, restaurants that served good food with well dressed and polite waitstaff, and high-end shopping malls. It led them up rocky mountain paths and down into hot and uncomfortable valleys. His nice car got scratched and dirty and there were miserable broken people all along the way begging Tom and Cheryl to give them some of their hard-earned money. It was a truly horrific experience. No, it was quite obvious to Tom that the nice wide highway with the smooth, well maintained pavement and with the malls, the restaurants, and the gas stations all conveniently located along the way - the road where that was kept free of the filthy beggars - this was the road that would get them home. With his sense of direction (and Cheryl's variety of maps) they'd make it there even if they had to ignore the signs some wackos had put up everywhere. You see, Tom and Cheryl's destination was a kingdom on the other side of a mighty chasm that was uncrossable. The King of that kingdom was very powerful and used all of His strength and all of His resources to build a mighty bridge, a single bridge, across the chasm. He then placed road signs all over the other side directing people to His bridge, the one and only way to the Kingdom. Rather than trust in Him, the people on the other side ignored the King's signs, built their own roads, and attempted to build their own bridges. The roads the people made were beautiful. The paths were comfortable. But the people simply didn't possess the ability to construct a bridge that would span the chasm. Everyone who attempted to use a bridge not made by the hand of the mighty King perished. Tom had heard these stories but didn't really believe them. He continued to ignore the signs that had been placed all along the highway, just like all of the thousands of other travelers that were on the road with him. The signs got bigger and bigger, placed every mile or so, and warned of destruction ahead, pointing to the correct path, but choosing to follow others and listen to his own pride (as well as Cheryl's maps) Tom, seeing a bridge ahead and sincerely believing it was the right one, drove he and his wife right off its edge and into the chasm. There is a mighty chasm that separates us from God. 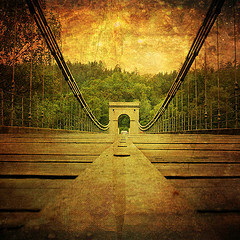 In his great love, God has built a single bridge for us to cross that chasm and come to Him. It is through Jesus and Jesus alone that we may find our salvation. This is not a secret path or hidden way. God has been shouting His warning and calling to you. He has left a detailed map and signs to point you to Him. There are many human roads that look comfortable and promise glory but they all end in destruction. The path to God, the path that He calls us to travel, is difficult. You will get dirty along the way. You will have to learn to place the needs of others above your own. You will have to learn to let go of those earthly things that take God's place in your heart. The road will take you through hot desert valleys and up difficult and rocky mountain trails. You will be called to minister to broken people who will revile you for trying to help them. Through this journey, however, you will find who you really are, you will find the person that you were created to be. You will learn to truly love and to truly know God in a personal and intimate way and to live with Him in His kingdom. Jesus Christ died to pay for every sin you have ever committed and was raised from the dead to build that mighty bridge for you to cross to the Kingdom that your heart desires. Don't ignore His signs. He is calling you. Listen to Him and heed His call.